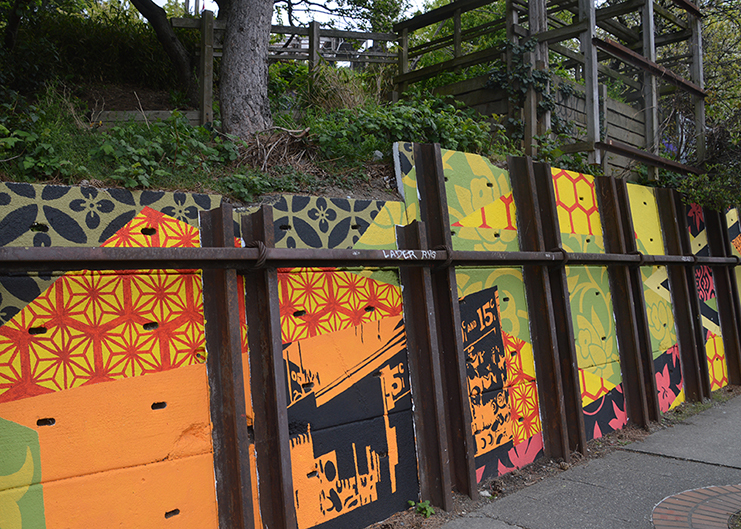 The mural is designed to capture to the neighborhood’s challenges now and in the future. 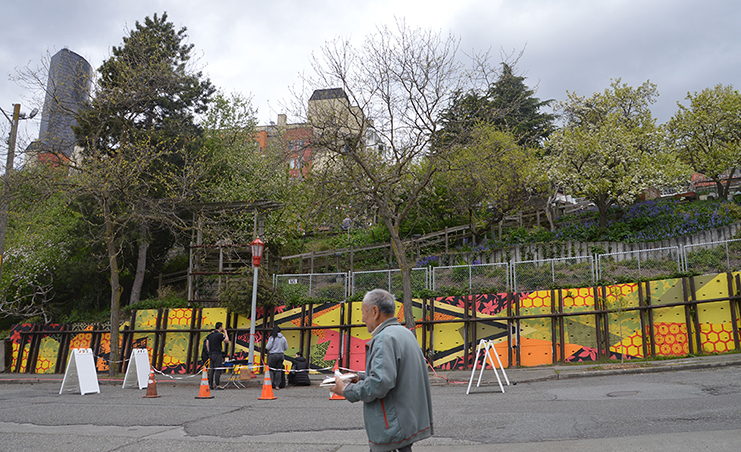 For over 15 years, InterIm Community Development Association (CDA) wanted to do something about the “gray, blank wall” at the entrance to the Danny Woo Community Garden, said Tom Im, InterIm CDA Deputy Director. Now, a patchwork of geometric Chinese, Japanese and Filipino textile designs and stencil-like renderings of a CID streetscape are painted on the concrete wall, at the intersection of South Main St. and Maynard Ave. 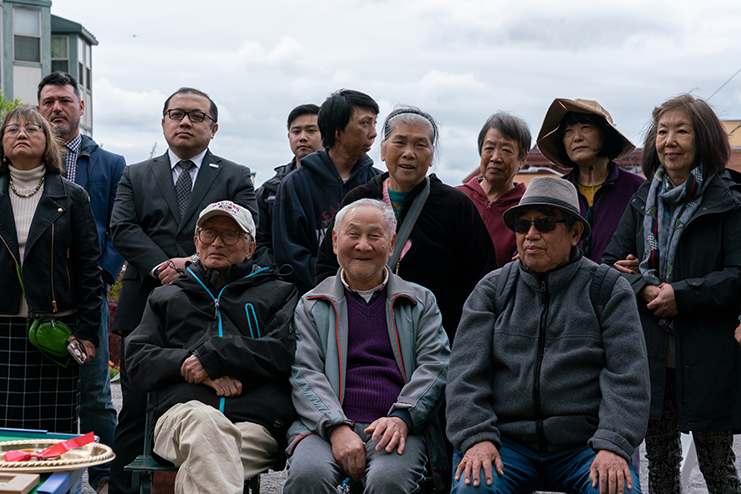 The mural represents decades of history in the Chinatown International District (CID), and is designed to capture to the neighborhood’s challenges now and in the future. 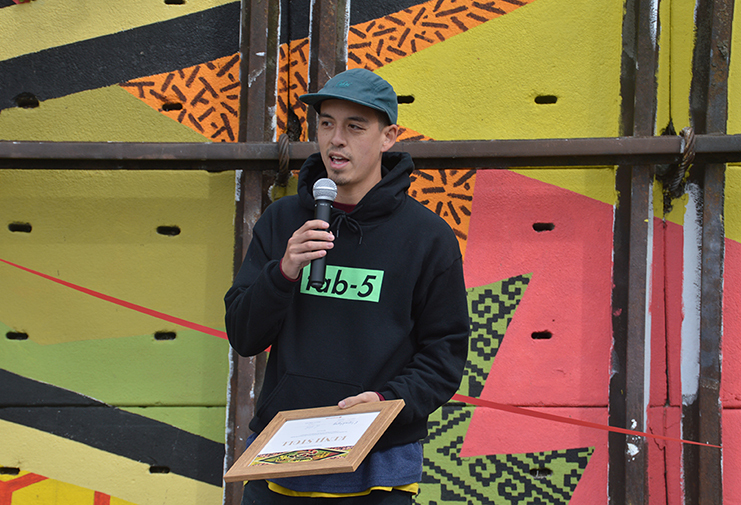 Designed by Tacoma artist Kenji Hamai Stoll, the project was developed by InterIm Community Development Association (CDA), with seed money from the City and a $25,000 dollar grant from U.S. Bank. Stoll’s developed his design after almost a year of research, consulting with local historians, gardeners, youth at InterIm CDA’s Wilderness Inner City Leadership Development (WILD) program. He pored over historical archives of the International Examiner and Asian Family Affair newspapers to learn as much as possible about the history of the community, Stoll said at the April 16 ribbon cutting ceremony for the mural. The mural aims to honor historic Japantown (Nihonmachi) and the displacement of the Japanese American community during WWII by drawing from old photos including businesses like the Higo store, images from Executive Order 9066 and the Japanese American Redress movement. It will also reference the protests led by Bob Santos, who played a major role in creating the Danny Woo garden and preserving the neighborhood. During the months of research Stoll spent designing the mural, some of the most significant feedback he heard from the community was about future development in the CID, including high rise market-rate apartment and condo projects in the pipeline. When the mural is finished, it will display more detail, including the Japanese character “Issin,” roughly translating as “one heart,” in the center. Stoll is working with a Japanese calligrapher from a temple in Tacoma, who will design the custom character, which can also be found in the Danny Woo garden and on the facade of Nihonmachi Terrace. Stoll felt the character and its meaning were fitting for the garden.